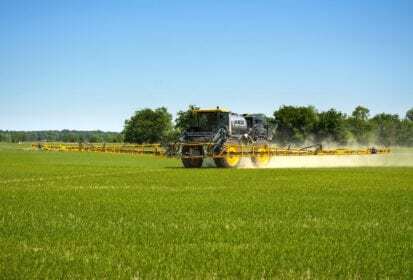 Hagie Manufacturing takes aim at updating its high-clearance sprayers for model year 2019. Engine changes will see MY19 Hagie STS10 and STS12 sprayers powered by a 6.8L PowerTech John Deere diesel engine, providing 280 and 300 horsepower respectively. These turbocharged, air-to-air aspirated engines are designed to deliver consistent power over a wide range of speeds and terrain. A new high-performance cooling package also improves fuel efficiency and overall performance for the two models. The engine compartment and hood on the STS10 and STS12 have also been redesigned to accommodate the new John Deere engines, while incorporating a new tool box and air intake scoop. “Commonality of engines across all John Deere and Hagie Sprayer platforms makes sense from a customer service perspective, making it easier and convenient for customers to get their sprayers serviced by their local John Deere dealers, no matter which brand they own,” says Doug Felter, product marketing manager for John Deere application equipment. Along with the engine and chassis changes, Hagie is expanding its Dual Product System (DPS). DPS allows the tank to be divided so that two different products can be applied in a single pass. Available for 1,200- and 1,600-gal. (4542 L and 6057 L) capacity Hagie Sprayers, the Hagie DPS gives operators the ability to accurately and variably place nutrients in the root zone while simultaneously broadcast applying crop protection products to the plant.